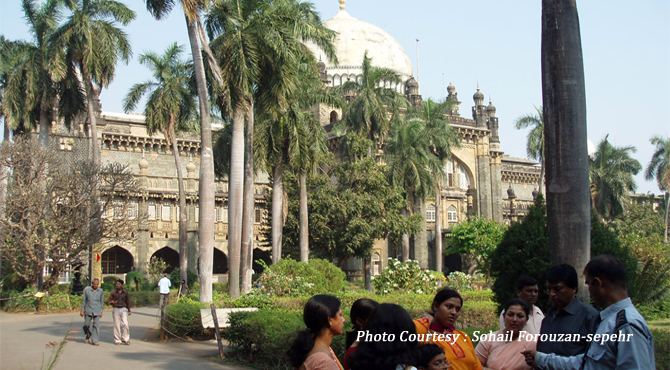 Chhatrapati Shivaji Maharaj Vastu Sangrahalaya formerly known as the Prince of Wales Museum is one of the most interesting museums of India. Located on the Crescent site on the way to the gateway Of India in South Mumbai, its magnificence and striking architecture makes it unmissable. The Museum was built to commemorate Prince George (Later George V) first visit to India in 1905. The first stone was laid by the then Prince of Wales. It was opened to the public in 1922. Designed by George Wittet in grant Indo-Saracenic style, the museum is set in an ornamental garden and boasts an impressive galleried central hall topped by a huge dome. In 1990 the museum was awarded Urban Heritage Award of the Bombay Chapter of the Indian Heritage Society. Its exhibits ancient items excavated from the Indus valley, Hindu and Buddhist sculpture, miniature paintings, weapons etc. This museum is divided into three floors with several galleries: art, archaeology, maritime, natural history etc. The ground floor has a domed gallery which has sculptures section and the natural history section. This section has 16th century miniature paintings, jade cups and weapons from the Mughal period, wooden and ivory figures including infact Jesus, made in Goa, heads and figurines from Gandharaand terracota Buddhist figures from Mirpur Khas. It also has artifacts from Elephanta Island and Jogeshwari Caves. The natural history section has a large selection of Indian birds, snakes and stuffed animals ranging from rhinos to monkeys and lions to deer. Other collections include terracotta figurines from the Indus Valley, ivory carvings, Chinese and Japanese art, portrait of Abraham Lincoln, and an excellent collection of Indian miniature paintings etc. The Sculpture gallery is situated right of the ground floor. It exhibits Buddhist, Jain and Hindu sculptures from Elephanta Island, Parel, Thane and Jogeshwari. It has a 6th centural panel from Samalaji in Gujarat, showing Shiva with a trident and snakes against a background of rocks accompanied by a splendid dwarf with curly hair from Koh in Madhya Pradesh. A staircase asends through a Mezzanine Gallery. It exhibits pots, beads, tools and toys. It consists ornaments excavated by Sir John Marshall in Mohenjodaro in 1922. The Octagonal Gallery, on the first floor hosts a large collection of metal work and beaten silver trays, bronze, jade, ivory items and a great collection from Nepal and Tibet. Miniature paintings adorn the walls. The Himalayan Gallery near to this has collection of brass objects and a beautiful 12th century Maitreya with his head surrounded by a halo. The Painting gallery has paintings of the main schools. It exhibits 14th century jain manuscripts, 17th century Mughal and Rajput miniatures and Deccan paintings. Elephant scene from Bundi in Rajasthan, a depiction of Rama with Sita from Aurangabad, Krishna playing with Gopis from Shorapur are noteworthy. Ratan Tata, a well known industrial figure donated the collection displayed in the Nepal and Tibet gallery. The nearby Textile Gallery has a large collection of shawls from Kashmir, ikat cloths from Gujarat and Sarees from Thanjavur and Kanchipuram. The Fine Arts Gallery houses Mughal glass especially huqqa bowls, gold jewellery, enameled jars and hookah, embossed silver and ivory figurines. The Bronze Gallery has a variety of items belonged to the period 9th Century to 17th century. Krishna dancing on Kaliya, Vishnu standing in an ornate frame are notable. The stairs ascend to the second floor is reserved for non - Indian art. Several artifacts of the Chinese and Japanese as well as European crystal and procelain, jade and ivory houses in Octagonal Gallery. The Arms and Armor gallery exhibits a large collection of Indian weapons through the ages. Swords with animal hilts and daggers with ornate blades can be seen here. Entry fee: Rs 25/- for Indian Visitors and 300/- for foreign visitors. Rs 30/- for camera.